Nick Castellanos (3B) DET - Castellanos did hit his 11th homer of the season on Saturday, but he's still ranked a disappointing 18th at 3B thus far in 2017. The 25 year old does have a lot going for him in terms of the underlying stats though, as a hard contact rate of nearly 50% does point to better things to come. In fact, our own Michael Waldo did a regression analysis of hard contact%, zone contact rate, and barrels, and tweeted the top 20 players likely to experience HR/FB gains in the second half. 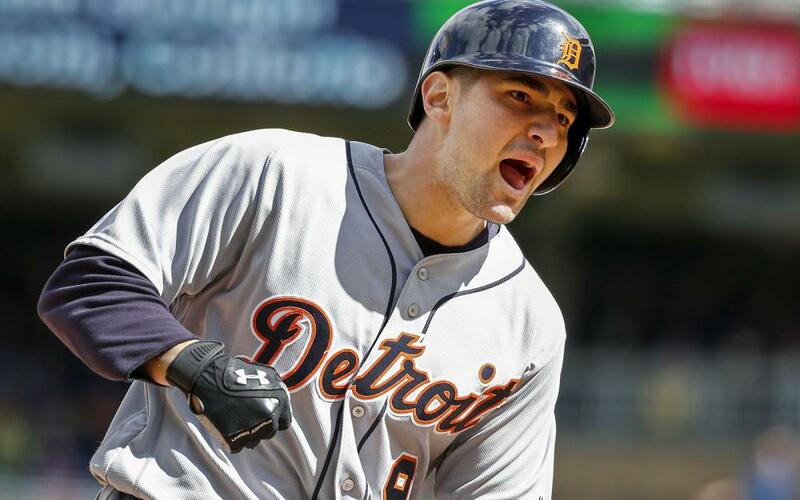 Players 2-20 were expected to show gains between 4.5 and 7.7 percent, but Castellanos lapped the field with an expected gain of 10.9%. Yes, I know about the contact rate, but between his batted ball mix and the amount of time he centers the bat on the ball, you should expect 10-20 points more of average AND better power numbers from Castellanos in the second half, making him an excellent acquisition target. Marco Estrada (SP) TOR - Something is clearly wrong with Marco Estrada, who walked 4 or more for the fifth straight outing after failing to do that once in his first 14 starts. Estrada's control has been getting steadily worse for 5 years straight now, but this is something completely different. His changeup is his biggest asset by far: since he became a starter in 2012 he's never thrown it less than 25% of the time, and it's been his best pitch value every season since. For whatever reason, Estrada has thrown the pitch less than 25% of the time in each of the past three starts prior to Sunday's after never throwing it less than 30% of the time in any prior outing. He's still getting strikeouts, but the flyball rate has jumped above 50% over that stretch while the control has deteriorated immensely. He claims there's nothing wrong, that he's struggling with the feel for his changeup, but whether that's the case or not he can't be trusted right now despite the K rate. I'd reserve him without dropping him in most formats right now, because A) I do have faith that he can figure this out, and B) after the Indians next week he has the A's and White Sox, two teams that are likely punting this year (and strike out a lot and/or struggle against RHP), coming up at the end of the month. Matt Chapman (3B) OAK - Chapman is 6-15 with 3 doubles, a triple, and 2 homers over his last 5 games. I'm being lazy here, but Chapman is basically a RH version of Joey Gallo, except he's in a less favorable park and plays a bit better defense (Gallo is surprisingly good for his size, but Chapman is excellent). The same issues are going to apply for both players: if they can make enough contact, they can hit 30 homers, perhaps 40 (easier for Gallo with the park effect by far). For now, view Chapman as a cheap power source if you can afford the AVG, and he's a decent injury replacement pick-up in points leagues, deep leagues, or AL-only formats right now. Any progress in the contact rate offers a guy like this huge potential for growth...there's lots of upside here but a very low floor. Sean Manaea (SP) OAK - After another very solid outing on Sunday, Manaea is 7-1 over his last 121 starts with 20 BB and 67 K in 71 IP over that stretch, and he's allowed more than 3 ER just once. Is it possible to quietly begin fulfilling your potential? Manaea has maintained a swinging strike% in the 13.5 range while pitching at a clear SP3 level while toiling in relative obscurity amidst the burgeoning fire sale in Oakland. Due to that, his acquisition cost might be a bit low right now relative to where it ought to be, something I would definitely explore. 25 year old power lefties in favorable pitching environments don't grow on trees. Yulieski Gurriel (1B) HOU - Gurriel has hit in 9 of 10 this month with 6 of those multi-hit contests, and he's dragged his line up to 298/324/492 on the season. He has 16 2B and 7 HR in just 136 AB since the beginning of June, amassing a hard contact rate of over 40% during this stretch as we continue to try to get a handle on just exactly who he is as a player. The 33 year old still has just 519 PAs at all levels here in the US (less than 1 season of data), so it's possible that he's more of a 20-25 HR guy, as he's shown over the past 6 weeks, than the 10-15 HR player he appeared to be previously. His contact rate appears solid enough to sustain this decent AVG as well, so despite the fact that Gurriel remains unowned in many formats, I do view him as a viable CI across the board at the very least.